I keep forgetting I’m a Time Traveler. Forgetting that we’re all traveling through Time at various rates and speeds, willingly or unwillingly, sometimes in an orderly fashion, other times pell-mell. But traveling all the same. Never standing still (in time), never motionless (in time), always moving, moving, moving. I know we live in Time, have calendars, seasons, birthdays. I see images of living beings captured in the Past and brought forward into the Present. I see the ravages of time. I see the passing of time. I see and I know, and yet I still keep forgetting. These days people generally live longer than they ever have. Death used to swoop down, indiscriminately carrying off young and old, rich and poor. When did old age and death become strange and weird? I know when we leave the body we are only leaving behind a shell that has outgrown its use. But what I know and what I feel can often seem like two different things. 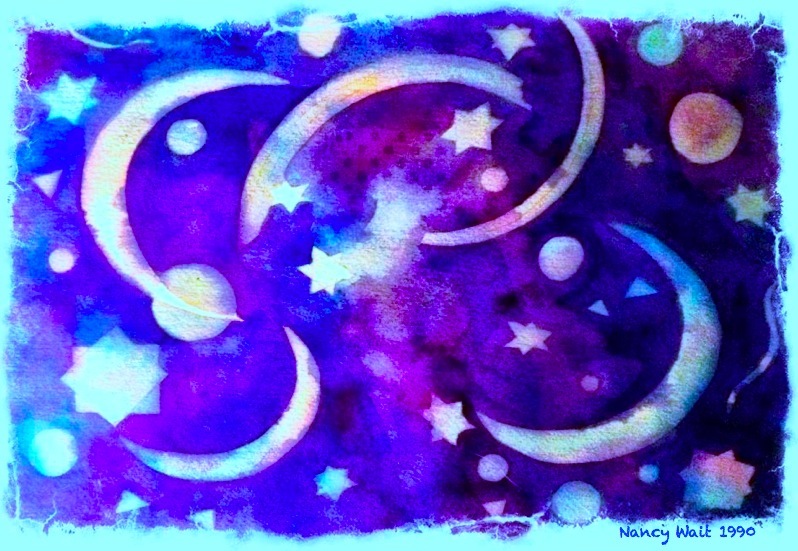 That is why I am taking another look at this watercolor I did back in 1990 of moons and stars and a shooting star. Stepping up into a greater reality. The heavens. The universe… To remind myself of a broader, more expansive view. Then, when I look down again, I see that death is only a transformation into another form (of life, of energy, of being). Nancy Wait is an artist a writer, a writing coach/editor, and author of the memoir "The Nancy Who Drew, The Memoir That Solved A Mystery." She is a former actress (stage, film and TV) in the UK under the name of Nancie Wait. She hosted the blog talk radio show "Art and Ascension," and more recently, "Inspirational Storytellers." Nancy is currently at work on the sequel to her memoir, "The Nancy Who Drew the Way Home," to be published in 2018. This entry was posted in ART and tagged acceptance of death, Art, art and ascension, baby boomers, dealing with change, moving through time, Nancy Wait, the nancy who drew, time, time travelers. Bookmark the permalink.